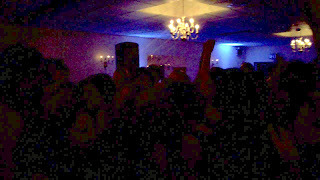 On April 30, 2010, DJ Jagged of Ambient DJ spun music to an enthusiastic and packed dancefloor. The event was held at Michael's Restaurant and Lounge in Morrisville, PA from 8 PM - 12 PM. I opened the dancefloor in earnest from 8:45 PM, and it didn't let up all night. Highlighted in red were the super potent hit songs of the night! A few of the sorority's special songs include "Piece of My Heart" - Janice Joplin and "Killing in the Name" - Rage Against the Machine. They also sang their sorority song towards the end of the evening. Oye Mi Canto - NORE & Co.